The numbers are in and it's not great news for the Swiss watch industry. The Q3 figures, published by the Federation of the Swiss Watch Industry, reveal an 9.9% drop in watch exports for September, leading to an 8.5% slide for the quarter overall. "After May and July, September is the third month to show a marked decline in Swiss watch exports," said a representative of the Federation of the Swiss Watch Industry, according to a report by Reuters. "This negative change has spread to other, hitherto more robust Asian markets and casts something of a shadow over prospects for the year 2015." It's a big slide - the biggest quarterly drop since 2009 - so it's understandable why flags are being raised. But what's most interesting is that the original report suggests the Apple Watch "could finally be taking a bite out of the Swiss industry's stake". According to the data, watches residing in the low to mid-segment, the domain where the Apple Watch Sport currently competes, were hit the hardest. It's reasonable to speculate that smartwatches are eating into the cheaper end of the market. "The problem is further weakness of Chinese demand amid economic uncertainty and the ongoing fallout from the anti-gifting campaign," Jon Cox, analyst at Kepler Cheuvreux, told techradar. "Over two-thirds of the value of Swiss watch exports comes from watches retailing on average at USD17,000 each - if you can afford one of those babies you can afford an Apple Watch." Asia accounts for over 50% of the luxury watch market right now, so you can see why this is a problem. 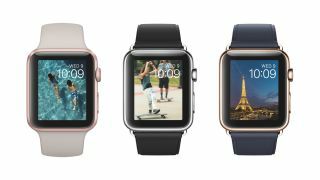 A September 2014 New York Times column claimed that Apple Chief Design Officer Jony Ive had said Switzerland was in trouble thanks to the Apple Watch - "though he chose a much bolder term for 'trouble'". "Traditional watch makers are coming under pressure," Ben Woods, Chief of Research at CCS Insights, told us. "It would be naive to think the Apple Watch has not impacted the traditional market in some form. Watchmakers are reticent to acknowledge that's happening because it's not in their interest." But as Woods points out, the real evidence is in how traditional watch makers are starting to respond. Just this week we saw Fossil announce its first Android smartwatch, Tag Heuer has one coming next month, and Guess Watches teamed with Martian for its new Connect smartwatch line. As smartwatch makers try to erode the traditional watch market, and traditional watch makers try to smart-out their timepieces, it's a race to the middle. "Watch manufacturers can no longer ignore this challenge, and they will partner with tech companies to do that," said Woods. "But the electronic companies are putting a greater importance of fashion, and you're going to see them standing up." The reason the higher end of the market isn't feeling the burn right now, claims Woods, is obsolescence. Where premium makers market their watchers as an heirloom to be passed down to the next generation, the technology inside the most expensive Apple Watch will probably be obsolete in a couple of years time. "Those high end companies can't ignore smartwatches completely, but they are more likely to go down a path where we see intelligent bands," said Woods. But for the lower to mid-tier bracket, watch makers may have to start seriously thinking about smartwatches encroaching on this space. Vontobel analysts highlight, via the original Reuters report, that Swatch is the only Swiss player with a strong position in this bracket. They also believe it will offer an impressive smartwatch offering of its own. Swatch recently introduced a watch with electronic payments to China, while Apple still hasn't moved Apple pay outside of the US and UK.